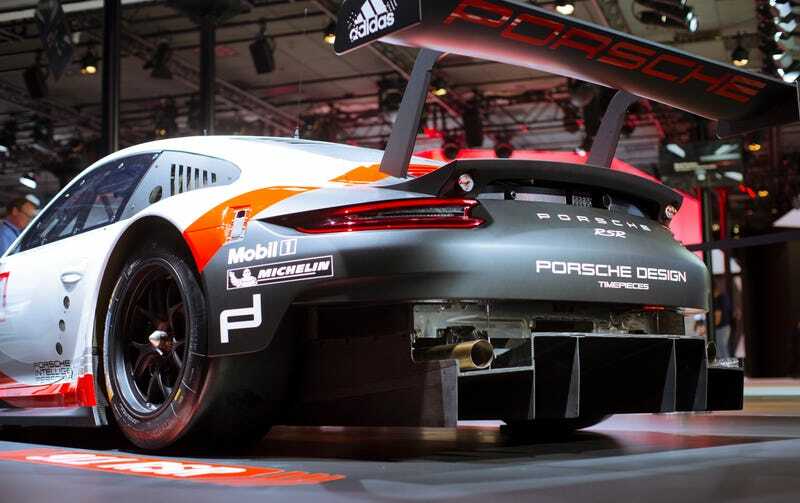 Porsche has been happy to announce that it has moved the engine in the 911 RSR race car from the rear to the middle of the car. Cool! But! Porsche was less keen to announce where the transmission went, but I found it hiding behind the engine as usual. See that disc shaped silver thing in the middle? That’s the car’s transaxle. It’s where a 911's engine traditionally sits, but it’s still in its usual spot in relation to the engine itself. Porsche didn’t move the engine in the 911 RSR because it finally submitted to weight balance thinking laid out, ironically, first by Dr. Porsche in the years before WWII. No, moved it to make a truly gigantic rear diffuser. It’s in the aero war that the car is suffering against newcomers like the Ford GT. It’s amazing that the transmission was just small enough to fit with all of the car’s new packaging restraints. Leave it to Porsche, I guess. CORRECTION: This article initiallyand incorrectly implied that Porsche 911 transmissions sit behind the engine. As a rear-engined car owner, this brings me great and personal shame. The article has now been clarified.